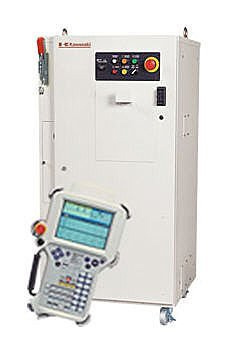 Versatile Robot Controller | PAK Automation Ltd. Allowing more effective and intuitive operation, a highly functional and versatile robot controller offers high level of expansion and easier operation and maintenance. In keeping with its role of one of the leaders in industrial robot technology, Kawasaki Robotics has launched a new robot control system allowing more effective and intuitive operation of the robot. The result is the new D Controller, a highly functional and versatile robot controller to meet the next generation of robot applications. It combines the latest hardware technology together with software which has been developed through the richness of diverse experience that exists within Kawasaki. Special attention was paid to ease of operation, the high level of expansion possibilities and easy maintenance characteristics. For control and operation of the robot, the operator uses the Teach Pendant with its keypad and 6.4in colour LCD touch screen. Dedicated software is also available for a wide range of applications including palletising, handling, spot-welding, sealing and arc welding. In addition, Kawasaki AS Language, a highly sophisticated robot programming language, expands the possibilities for advanced motion and process control. The D Controller offers high expansion capability with its compatibility with not only standard digital I/O, but also a variety of Fieldbus I/O systems such as DeviceNet, CC-Link, Profibus and Interbus-S to give direct connection to a wide range of peripheral equipment. Also available is K-Logic, a built-in PLC programmed with easy ladder logic as a normal industry standard. The system supports network communication through Ethernet allowing data transfer between the controller and a host computer for program upload and download. Web server functions can also be used for remote access enabling remote diagnostics and monitoring of robot status. An additional 2 axes can be easily incorporated into the standard 6-axis controller with up to 16 axes being possible to meet the exact customer requirements of a multi-axis robot system.